Did anyone ever tell you you look like Andy Serkis? If I were 10 years old, The Kid Who Would Be King would be my favorite movie. I’d watch it every day, twice on Sunday, run wild with a fake sword, and pretend to save the world with my friends. As an adult, the film didn’t have quite that impact on me but it’s easy to recognize its earnest joyfulness that taps into those childlike feelings. For better or worse, it feels like a movie from another time. 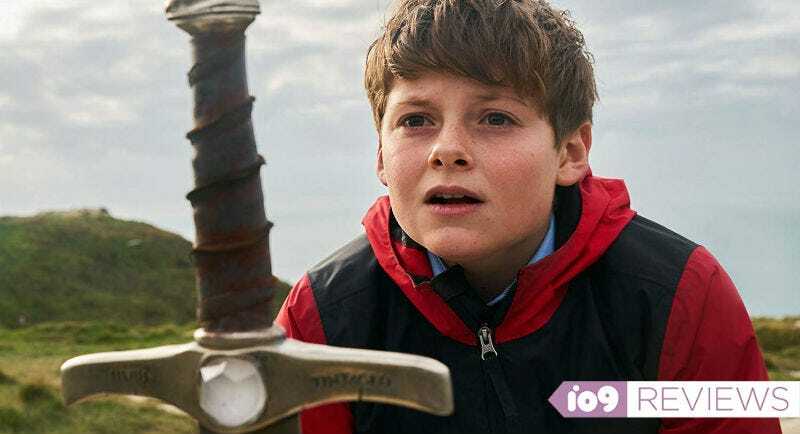 The Kid Who Would Be King is the second film from director Joe Cornish. He famously directed 2011's Attack the Block, one of the best sci-fi films in recent memory (officially, as decided by us.) Somehow though, it’s taken seven years for him to direct another film. 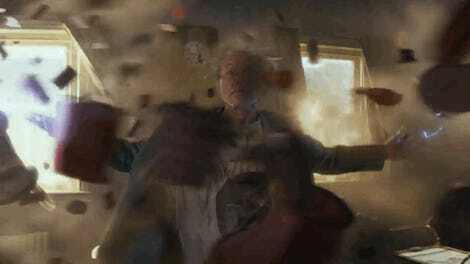 That’s a whole other issue but at the start, the movie does feel like the work of a super talented filmmaker who had to shake off some rust before really returning to form. To that end, events in The Kid Who Would Be King get off to a slow, rocky start. The film stars Louis Ashbourne Serkis (yes, the son of Andy Serkis) as Alex, a brave young boy with a fairly typical modern life. That is, until he finds a sword sealed in stone that he alone is able to release. Soon he realizes this is indeed King Arthur’s Excalibur and finds himself in the middle of an ancient tale involving the wizard Merlin (played by both Patrick Stewart and Angus Imrie), an evil witch named Morgana (Rebecca Ferguson), and all the classic King Arthur stories everyone has heard before: roundtables, Lancelot, you name it. Angus Imrie (center) plays Young Merlin and steals the show in The Kid Who Would Be King. Cornish takes his time setting all of this up, making for a first act that’s charming, but a tad restrained. Slight, even. Alex has to make allies, work himself up into the adventure, and only parts of all of this really stand out—like Imrie’s hilarious and charismatic Young Merlin, who lights up and steals every scene he’s in. Even the film’s pulsating synth score in these early scenes, written by Electric Wave Bureau, feels like it’s holding back waiting for something greater to come along. As The Kid Who Would Be King moves on though, Cornish’s story, style, and even the music continue to crescendo. A tale set primarily in a suburb starts to feel like Lord of the Rings as the characters venture out into the countryside. There’s even a little superhero flavor when the battles get bigger and bigger. As Alex and his friends get further along in their adventure, the movie continues to blossom from there, finally building to an excellent, epic third act that makes the entire journey to this point pay off in some nice, rewarding ways. As Alex, Serkis has a grounded, sweet charm about him. He’s confident but not cocky. Proud, but also relatable. He’s the kind of hero kids can really look up to and adults can be proud of. His supporting castmates—Tom Taylor as Lance, Rhianna Dorris as Kay, and Dean Chaumoo as Bedders—contribute to Alex’s complex growth while also having solid arcs themselves. Imrie is the showstopper, as previously mentioned, while Stewart and Ferguson each have a blast playing these larger than life mythical creatures. Rebecca Ferguson is awesome as the villain Morgana. In addition to the action and comedy, The Kid Who Would Be King also really has a lot of strong, thematic lines going through it. It’s a film about friendship, loyalty, and trust. About the way the world has changed, and how now, more than ever, we need the next generation to step up and be the heroes we know they can be. Those sentiments add important layers to the film that give it a nice aftertaste. Even if the whole thing isn’t a total slam dunk, you know it’ll age well. The Kid Who Would Be King isn’t quite Attack the Block—but, really, what could be? Cornish himself set a nearly impossible bar with that landmark first film. So, the fact that his sophomore effort still manages to entertain and engage, despite a few flaws along the way, feels about right. Here’s hoping that not only does Cornish pick up the pace and make more movies, but that maybe one day we even get to see what Alex and his friends are up to again. The Kid Who Would Be King opens January 25. Joe Cornish&apos;s Rust is aiming to be the next E.T. The year&apos;s best alien invasion movie hits the U.S. this summer!